"Since many years I follow your website and I visit it almost every day to check the newsletter. I specially like 'Odyssey' stories since these are very personal. I would like to add a personal story about Pfc Harold F. Taylor (36570821), 82nd, D Comp, 2nd Bat who was KIA Drop Zone 508th PIR, D company on the 18th of September 1944 in Groesbeek Holland. Harold was KIA on the 2nd combat day in operation Market Garden. Just before the landing of the glider artillery and infantry, the drop zone was overrun by German infantry. His unit was ordered to immediately clear the drop zone called LZ-T. They succeed but with many wounded and KIA. Harold was one of them. [Together with my friends] Rick Hermsen and Mario Wijnhoven we search together for many years and the three of us found the canteen cup. Rick's dad (Theo Hermsen) was even an eyewitness during the war (he was interviewed in the documentary). He lived at the Lerkendael farm (on the LZ-T) and that morning a couple of paratroopers joined them for breakfast. Maybe Harold was one of them. That morning the fighting started and their farm went up in flames. Under intense fire they had to evacuate. Harold got killed that same afternoon and he was temporarily buried along the drive of the farm. In 2004 we found with our metal detector a US canteen cup with the inscription 'paratroop' and 'H.F. Taylor'. Five years later we got in contact with his brother Victor Taylor (age 86), so we could hand over the canteen cup and tell him about the final actions of his brother. Together with his picture we got an idea about who he was, a young paratrooper who gave his ultimate sacrifice on the second combat day in Holland. We visit his grave every year at the Margraten cemetery in Holland. Please find attached the pictures of Harold and a link for a video from a national TV program (in Dutch) and attached the translation in ENG." Reporter: I’m on my way to visit Groesbeek for a special drinking cup from WWII. It has been found by three friends. 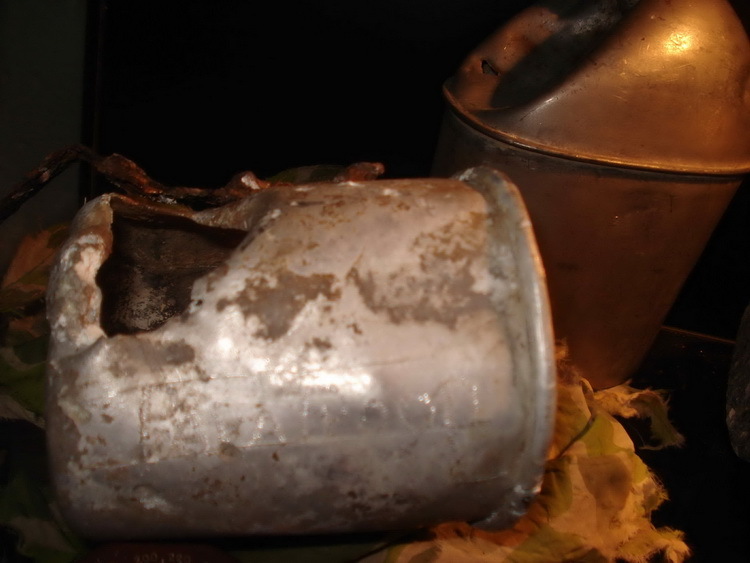 Geutjes: Most of the people would say it is a corroded canteen-cup, but then it appears to have a whole story. 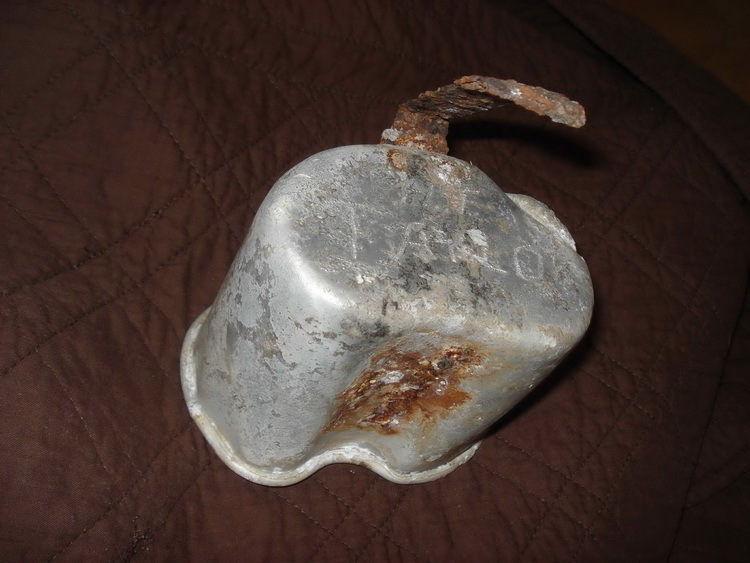 Reporter: Six years of intensive research by Paul Geutjes led this corroded canteen cup to a young American soldier. The story started in 2006 when Paul and his friends were busy with their hobby to search for WWII items. Geutjes: It was a Saturday afternoon and Rick, Mario and I were searching at Theo Hermsen’s farm. We were searching for a while and we didn’t find anything special, until the end of the afternoon when we had a small signal. We made a hole in the ground and relatively fast we found the canteen-cup. We are standing on the exact spot where we found the canteen cup. Reporter: Can I hold it? Reporter: It originates from WWII? Geutjes: Yes, this item is from WWII and was carried by a US paratrooper. Some people would say ‘Why are they doing this’? It is a piece of metal or corrosion, but the research behind this item was quite intensive but at the end it became really special. It starts with a piece of metal but at the end it results with a special story. In particular, this one is unique. Reporter: During the war, there was a lot of fighting in Groesbeek, so to find a canteen cup of a soldier is not really uncommon. What’s so special about this canteen cup is the inscription. Geutjes: That evening Rick cleaned the cup at home and he found initials and a name of the soldier on the bottom of the cup. Reporter: What does it say? Geutjes: H.F. Taylor which stands for Harold Francis Taylor. Geutjes: Yes, it is difficult to read but it is really the case. You have to look carefully. Fortunately, there is an online registration system for the fallen US paratroopers. At the same evening, we check this name and we found out that this soldier was killed during the war, so we thought, oh, this is then a really special item. We found something of a young person who was killed probably at that spot. Then instantly, the cup gets a whole other dimension. Reporter: Then Rick’s dad, Theo, hears about the story. He was 6 years old when the Americans landed in Groesbeek on the 17th of September 1944. During operation Market Garden more than 100 U.S. troopers were dropped in Groesbeek, and he eye witnessed this. The cup brought back a lot of memories. Reporter: Did you see any paratroopers? Theo Hermsen: On a Sunday afternoon the paratroopers came to our home. We had never seen this before, not even soldiers, and there were even a lot of ‘colored’ American soldiers which was a surprise at that time. They came and ask if they could get a breakfast the next day. And we made this appointment. So, on the Monday morning at the 18th of September they came at 07.00 because I can remember that we walked in our pajamas. My mother helped these soldiers. But at a sudden moment the farm was attacked from the other side of the road (Wylerbaan road). They were the Germans. Reporter: On the other side of this road? Theo Hermsen: Yes, at that moment the soldiers ran outside with the sandwiches in their mouth. They were in a hurry and signaled us to take cover. Thirty minutes later the whole farm was in fire. Reporter: Back to the canteen-cup, back to 2006. The boys now know that the paratrooper is named Harold Francis Taylor. But this is not enough for Paul. He wants to know more about the owner of the canteen-cup and starts his research. Geutjes: I started with an advertisement on internet, to ask people if somebody knew him. One year later we got one reaction, quite unexpected I must say… I had actually lost hope, from Monique Weyman, she lives in the South of Holland and she had adopted the grave of Harold F. Taylor. Reporter: So, you can adopt a grave so somebody visits the grave and brings flowers? Geutjes: Yes, he or she visits this grave and attends at commemorations and ceremonies to represent the family. Then when she came in contact with family she informed them that we are looking for relatives, and then we got in contact with his younger brother. We received a nice letter with information about him, about his personal life, and this was what we were searching for. We finally got more background information. We only had a name with some information, but we did not have any pictures. Reporter: You could also provide the family information? Geutjes: Yes, the family thought that he landed at this area, and that he had to go to Nijmegen to seize one of the channel bridges. And they thought that he was killed at that action. Reporter: You could inform them that probable he died in this field? Geutjes: Yes, we are almost sure about this, something the family didn’t know. Reporter: But now that they found this cup so close to the farm, is it possible that this soldier also had breakfast with your family? Theo Hermsen: This is still something what’s keeps me busy. This is something what we can’t find out anymore… that’s over unfortunately… This made it really special, we found the cup, the story gets complete, people come with information and then it is much closer than we ever could imagine. Rick’s dad comes with a story which closely resembles it, which is really special. Reporter: You are not searching for any metal, but you are searching for stories. Geutjes: Maybe you can see it like that yes, yes exactly. I see it as a tribute for what he did. Probable there are thousand maybe hundred thousand stories, and this is one of them. For what happened at that time, I think these stories deserve the respect by taking a moment and thinking about it.